This week I transcribe a newspaper article that appeared in the April 9, 1907 St. Louis Post Dispatch. 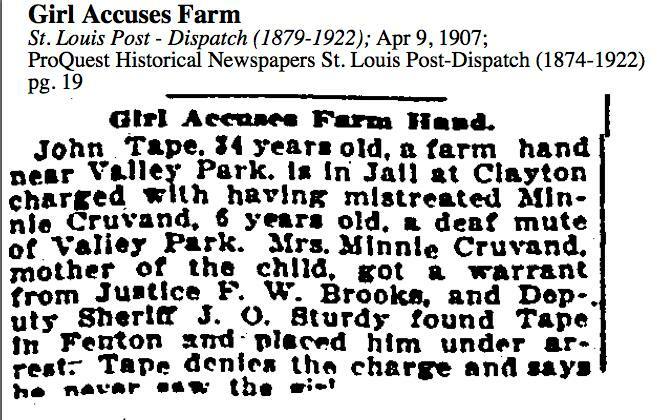 John Tape, 34 years old, a farm hand near Valley Park, is in Jail at Clayton charged with having mistreated Minnie Cruvand, 6 years old, a deaf mute of Valley Park. 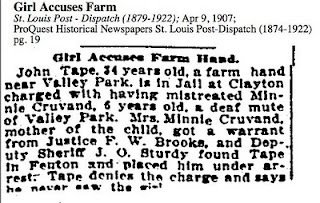 Mrs. Minnie Cruvand, mother of the child, got a warrant from Justice F. W. Brooks, and Deputy Sheriff J.O Sturdy found Tape in Fenton and placed him under arrest. Tape denies the charge and says he never saw the girl. 1) It's important to note I have no idea what happened with the case - whether John Tape was found guilty or not guilty. Nor the exact details of what he was accused. "Mistreatment" may have covered a broad territory. 2) Minnie's mother is misidentified in this news article as having the same name as her child. The mother is actually, Pearl (Grossberg) Cruvand, who was also mentioned in the article I transcribed last week. Minnie was my paternal grandfather's second cousin. 3) Minnie lived from 1902-1980. In 1968, when she applied for a social security number, she was living at a state home which is now called the Bellefontaine Habilitation Center. 4) Valley Park, Missouri is about 20 miles west from the home in St. Louis City where the Cruvand family were recorded as living in 1904. City directories indicate the Cruvand family were still living at their city address in 1917. I suspect Minnie was living at a state home in 1907.